Measures: Steps taken by the government to correct the market failure due to the externality. On a diagram this is the line that shifts the externality from Q1 to Q* (Q Optimum). Market Failure: Market Failure occurs when the price mechanism imposed in the market results in inefficient or unfair allocation of the market’s resources. On a diagram this is represented by the difference between Q1 and Q*. Negative Externality: A Negative Externality is a spillover effect that has an impact on ‘outsiders’ of the market for which they receive no compensation and that are disadvantageous. On a diagram this is a shift of the marginal private cost or benefit from right to left along the supply curve. The question here is specifically asking for a single part of the Negative Externality diagram. However, before we can look at the specific aspect of the diagram the question is asking for, we have to understand that there are two types of Negative Externalities, and question does not specify which it is asking for. Because of this, when answering the question, you have to be able to respond to both the effects of a negative externality of production and a negative externality of consumption. A negative externality of production occurs when a factor of production affects a third party in a disadvantageous way and they are not compensated for it. An example of this would be pollution from production at a factory. A negative externality of consumption occurs when a factor of consumption affects a third part in a disadvantageous way and they are not compensated for it. An example of this would be second hand smoke from cigarette smokers. In understanding how the government has to adapt to correct these negative externalities, we have to first separate the two and understand exactly what causes each. Starting with the evaluation of the negative externality of production. Here, a factor of production causes the Marginal Private Cost (MPC) and the Marginal Social Cost (MSC) to be unequal. 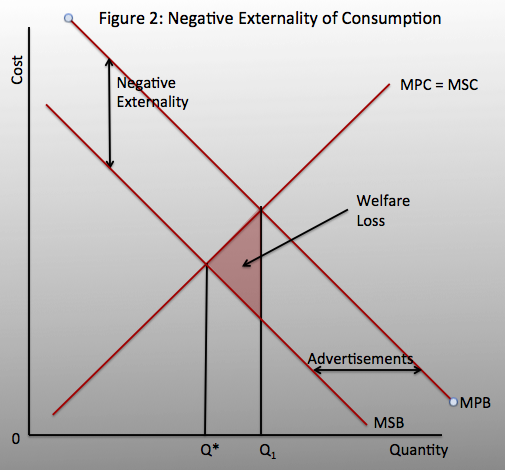 Since the externality is negative the MSC is less than the MPC, shown as a shift to the left in Figure 1 below. By measuring the distance between the two lines, we can accurately assess the quantifiable value of the negative externality. Production is set at the point where the MPC is equal to the Marginal Social Benefit (MSB), which in this case is also equal to the Marginal Private Benefit (MPB). This point is at Q1, but it does not take into account the production costs levied on the social group involved in production. Because of this, the market is failing to produce at a level that accounts for the complete cost of production (both MPC and MSC). Because of this market failure, a welfare loss is experienced in the market. 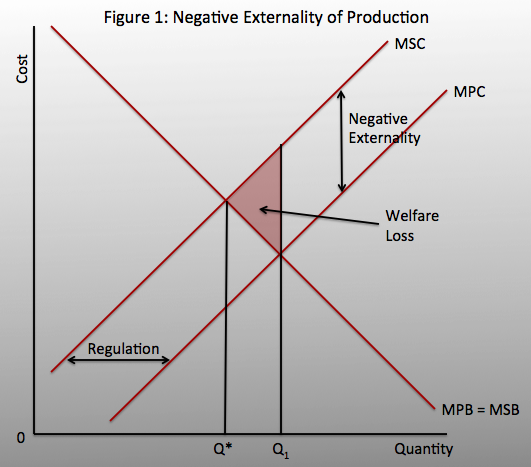 A welfare loss occurs when the optimal output for society is not achieved, such as when MPC and MSC are not equal. This value can be quantified and is represented by the highlighted triangle in the diagram. By shifting the production from Q1 to Q* however, the social cost of production is accounted for, and the welfare loss eliminated. This shift from Q1 to Q* and from MPC to MSC can be measured as well, and is the measure that the question is asking for. By taking some measure to shift Q1 to Q*, the government is able to correct the market failure. There are a number of ways this can be done, including taxation and regulation. Taxation on production is the most common form of market failure correction, as it is the easiest to apply and cheap for the government to maintain. Taxation involves simply requiring the firm to pay a fine for their spillover that is causing the negative externality. This is most commonly applied for things such as resource waste, and pollution (e.g. A firm is forced to pay a fee for every cubic litre of carbon dioxide they produce). Regulation is another common form of market failure correction, however it involves slightly more active involvement on the government’s behalf in order to enact it. Regulation includes simply limiting how much of a spillover the firm is allowed to produce. This is also common amongst pollutants created during production and material waste generated (e.g. the amount of waste a factory is allowed to produce every month is limited). 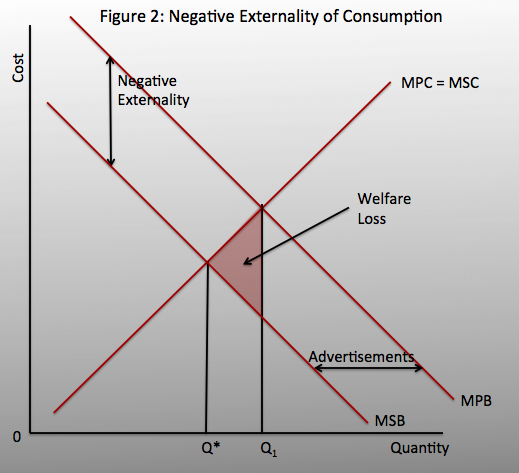 Next, we can look at the evaluation of the negative externality of consumption. Here, a factor of consumption causes the Marginal Private Benefit (MPB) and the Marginal Social Benefit (MSB) to be unequal. Since the externality is negative the MSB is less than the MPB, shown as a shift to the left in Figure 2 below. By measuring the distance between the two lines, we can accurately assess the quantifiable value of the negative externality. Production is set at the point where the MPB is equal to the Marginal Private Cost (MPC), which in this case is also equal to the Marginal Social Cost (MSC). This point is at Q1, but it does not take into account the consumption costs levied on the social group involved in consumption. Because of this, the market is failing to produce at a level that accounts for the complete cost of production (both MPB and MSB). Because of this market failure, a welfare loss is experienced in the market. A welfare loss occurs when the optimal output for society is not achieved, such as when MPB and MSB are not equal. This value can be quantified and is represented by the highlighted triangle in the diagram. By shifting the production from Q1 to Q* however, the social benefit of consumption is accounted for, and the welfare loss eliminated. 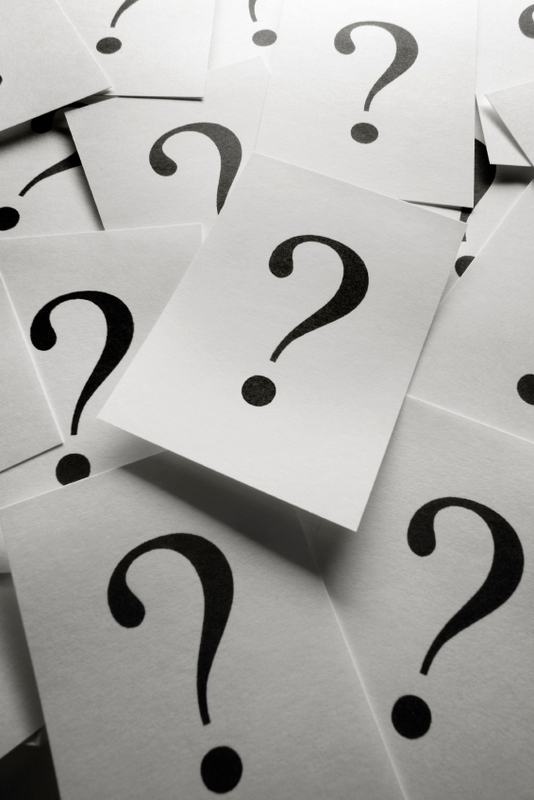 This shift from Q1 to Q* and from MPB to MSB can be measured as well, and is the measure that the question is asking for. By taking some measure to shift Q1 to Q*, the government is able to correct the market failure. 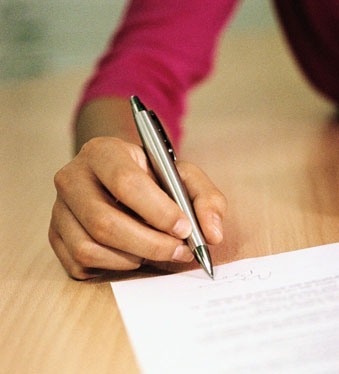 There are a number of ways this can be done, including advertisements and regulation. Advertising is a common form of market failure correction that is a very basic step acting against the negative externality. Advertising involves placing adverts that warn of the effects of the negative externality, and encourage people to reconsider the effect they are having on the third party (e.g. Television commercials talking about the effects of smoking in public). Regulation is another common form of market failure correction, however it involves slightly more active involvement on the government’s behalf in order to enact it. Regulation includes simply limiting effect of the consumption externality by limiting it’s exposure to the third party (e.g. Building designated smoking areas and banning smoking in public). In my most recent summative examination in IB HL Economics, I feel I have failed to effectively elaborate upon the question. In explaining the differences between profit maximization and sales revenue maximization, I missed the explanation between the two ideas as goals of a firm. An example of this is that while it may seem most sensible for a firm to maximize it’s profit, a goal aiming at long run production increase could choose to increase it’s sales revenue in order to lower cost, exploiting an economy of scale and marginal return increase. This is represented on a normal cost curve diagram as the cost of the product shifts downward along the AC curve. As well as this sales revenue maximization is a goal of the firm in increasing market shares, as lowering cost will result in the firm being able to gain more customer loyalty and temporarily boost sales. This idea as a goal of a firm is especially important in a monopolistic competition style market, where consumer loyalty and lowering prices is important in controlling market shares.